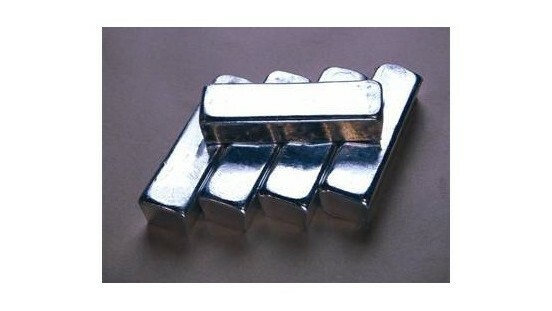 Tungsten bar is fine-grained, has a uniform color and has a luster much like that of silver. Tungsten bars are used in a number of industrial applications including production of light bulb filaments, proweights and counterbalances, making special steel alloys and producing tungsten wire. Because of tungsten’s unique characteristics, it is not refined in the same way as most other metals. Tungsten suppliers produce tungsten bars by grinding tungsten metal ore into a fine powder. Chemical processing of the powder then forms tungsten oxide, which is heated to reduce the metal ore powder into pure tungsten powder. This pure powder is placed in a mold and hydraulically pressed into a bar form. Because the resulting bar is very fragile, the producers must then sinter the bar. Sintering further binds the metal powder in the bar, making the bar ready for shipment to manufacturers. The chemical reactions and filtering relevant to refining and accomplishing the needed level of purity is a complicated and precise process, but generally results in high purity tungsten powder. This powder can vary in particle size and shape, depending on the intended purpose. Sometimes it remains in its powder form for use, but more often it is compressed and arranged into a solid form. This consolidation involves a series of procedures relating to high temperatures, electrical current and an atmosphere of hydrogen. During this development, the tungsten condenses and hardens, whereupon it becomes its bar form. At this point, a tungsten bar lacks the necessary level of resilience and strength for manufacturing and must then go through further operations so that it may be rolled and drawn or flattened into its final and desired form. The subsequent processing usually involves pulling the tungsten bar through dies, rolling it through mills and administering high temperatures and electrical currents. Tungsten Bars Tungsten bar is produced by tungsten suppliers from the metal tungsten. Tungsten has a very high melting point of 3422 degrees Celsius, good corrosion resistance and can be added to other metals to produce extremely hard alloys. Tungsten in bar form is most often supplied as 99.99% pure tungsten, which can be brittle.